Unlike any other place I’ve lived, North Beach has its way of working its way into your heart, of leaving its mark on you. People come and go here, as in any city. But whenever I speak to someone who has departed the Beach, their affection for the old neighborhood is unmistakable. They seem to have taken the place along with them somehow. And I’ve heard it said: when you know someone from North Beach, you’ll know them forever. A little over a decade ago I met Peter Rizos, who was at the time managing the recently departed Cafe DeLucchi on Stockton Street. Back then, we would run into each other once in a while after hours, at what used to be Amante. It’s a tight-knit neighborhood, and we became familiars, then friends. After he left DeLucchi, I found out that Rizos had started a new company–making cheesecakes, of all things. Unbeknownst to me, he had actually been dabbling in the trade since 2003. And these were not just any cheesecakes. According to the A-list chefs who were his first local customers, they were among the best you could find anywhere. Rizos kept baking, and it wasn’t long before I heard he was making the leap, and leasing a space at the Ferry Building–San Francisco’s artisanal food epicenter. 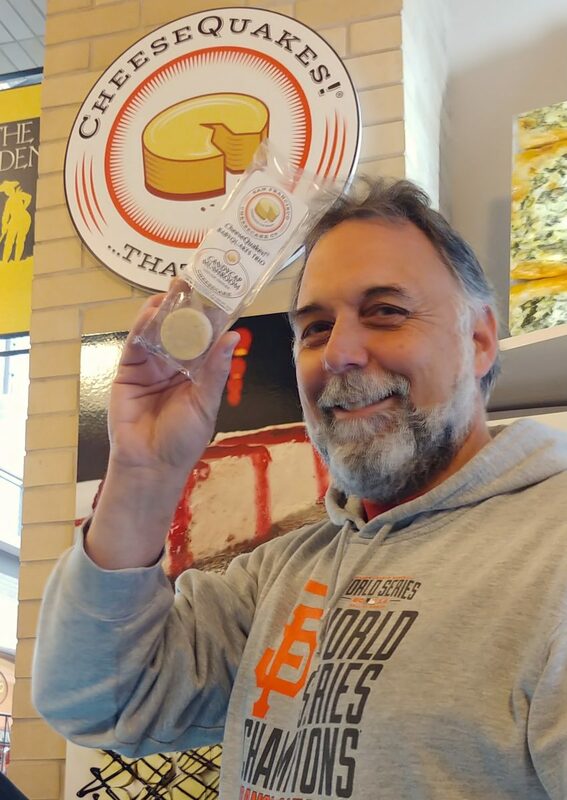 * Rizos opened the shop in 2016, and representing for the West Coast, and went with the name San Francisco Cheesecakes. After all, if New Yorkers could have their own cheesecake, why not San Francisco? That being said, Rizos had another name when he first started, and it was a damn good one: CheeseQuakes!. Catchy, right? And when he started selling savories and other products that weren’t strictly cheesecakes, Rizos decided to go back to it. 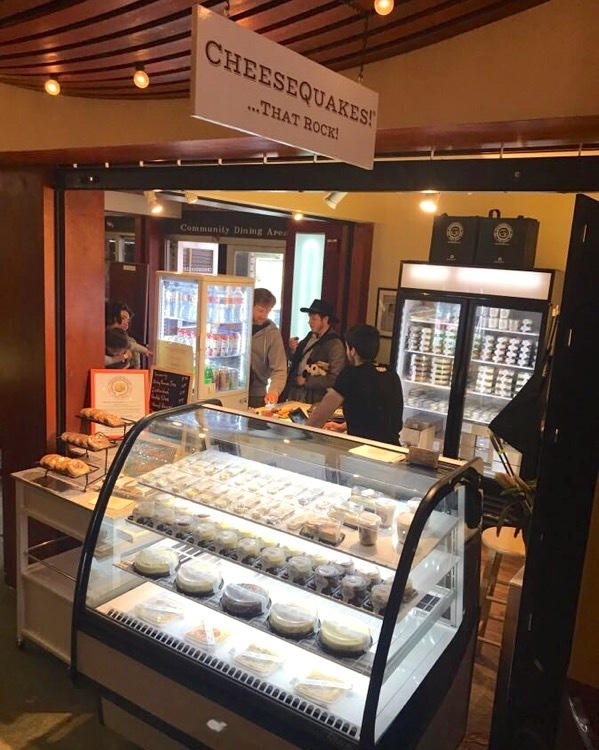 Befitting their (sort of) new moniker, CheeseQuakes has continued their roll, recently opening a second location in Epicurious Garden in Berkeley. Known as the “gourmet ghetto”, the neighborhood is the original home of both Peet’s Coffee and Alice Waters’ Chez Panisse, and over the years it has become a local oasis for food lovers. By all indications, CheeseQuakes should fit in perfectly. Expect to see both sweet and savory examples, including lots of unusual flavor combinations like Snickerdoodle, Caramel Pumpkin and Chocolate Fernet; there’s even one made with Old Rasputin Stout. And don’t forget to try what may just be CheeseQuake’s signature creation: the Candy Cap Mushroom Cheesecake. I know what you’re thinking, and just trust me–with a delicious flavor that is almost indistinguishable from maple, this stuff is fantastic. Meanwhile, do yourself a favor, and make sure to visit one of CheeseQuake’s two locations below. See you there!